Fairly rare. Not good condition but the only one I have come across. A fairly busy scene. Notice two way traffic and cars and buses parked where Falaise Square is now. 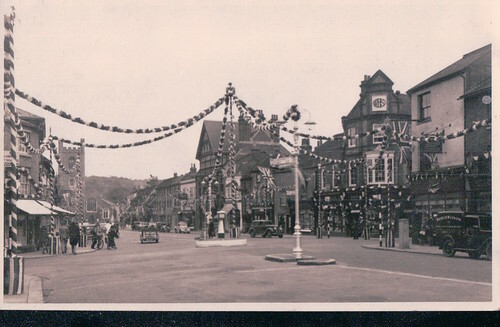 Market Place during the coronation of Queen Elizabeth II in June 1953. A view taken in the 1960s of shops adjacent to the town hall in Market Place. 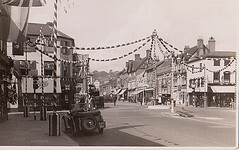 A view taken in the 1960s of Facy of Henley, Market Place. A view taken in the 1960s of the Victoria public house, Market Place. A view taken in the 1960s of the Argyll public house, Market Place. 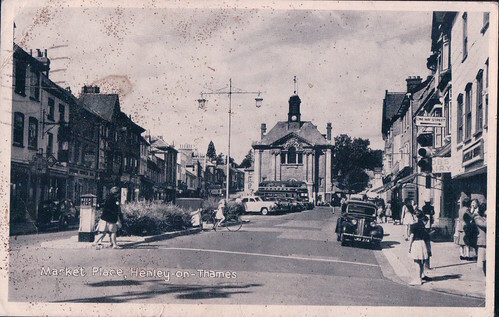 Not much road traffic in this old photo of Market Place in Henley looking towards the Town Hall. Not a car to be seen in this old view of Market Place looking towards Saint Mary's Church. A couple of building of note on the left; Remenham Dairy and "The Oxford". An old picture of Market Place looking toward Hart Street and Saint Mary's Church. Market Place in Henley taken from the town centre crossroads.